Sprouting links: Neurons with an autism-linked mutation (bottom) form more connections than do control neurons (top). A mutation that boosts the activity of the autism risk gene UBE3A may cause neurons to form too many connections, disrupting brain development. Some people with autism have extra copies of the gene, so the findings, published last week in Cell, add to evidence implicating UBE3A in autism1. The new study identifies a molecular switch that controls the activity of the UBE3A protein. By mutating this protein, the researchers found that they could lock the switch in the ‘on’ position, thrusting the protein into overdrive. The researchers received unexpected support for their finding’s implications for autism when another lab identified a child with the same mutation2. The child, who has autism, has hyperactive UBE3A. The findings also hint at a possible therapeutic strategy for children with duplications of the UBE3A gene, says lead researcher Mark Zylka, associate professor of cell biology and physiology at the University of North Carolina at Chapel Hill. Drugs that turn off UBE3A may help to counteract the effects of having too much of the protein in the cell, he says. Zylka and his colleagues initially set out to study the effects of mutations in UBE3A associated with Angelman syndrome, a developmental disorder marked by intellectual disability, seizures and an unusually happy demeanor. They found that some of the mutations affect the end of the UBE3A protein that flags defective or unneeded proteins for destruction, the most established role for UBE3A in the cell. But the researchers also discovered mutations clustered near a region of the protein that is modified by an enzyme called protein kinase A (PKA). The enzyme plants a phosphate group on UBE3A, impairing the protein’s activity. Preventing the addition of this phosphate group makes UBE3A hyperactive, the researchers found. By contrast, adding a mutation that mimics the presence of a phosphate inactivates the protein. Treating neurons with drugs that activate or inhibit PKA achieve similar effects, Zylka’s team found. For example, a drug called rolipram inactivates UBE3A. Scientists have tested the drug as a potential treatment for depression, but later abandoned it because it causes nausea, vomiting and other side effects. Still, the new study suggests that drugs like rolipram may be able to regulate UBE3A activity, and counter the effects of having too many copies of UBE3A, Zylka says. The researchers then looked at UBE3A in neurons from embryonic and newborn mice. They saw that levels of the inactive form of UBE3A peak one day after birth and taper off during the first week of life, a time when connections between neurons — called synapses — form. These findings suggest that regulation of UBE3A activity during this period may be important for normal brain development. The researchers mutated UBE3A in mice to either boost or suppress the protein’s activity. They found that mice with overactive UBE3A — the same mutation found in the child with autism — have a high density of dendritic spines, the small neuronal projections that receive signals. 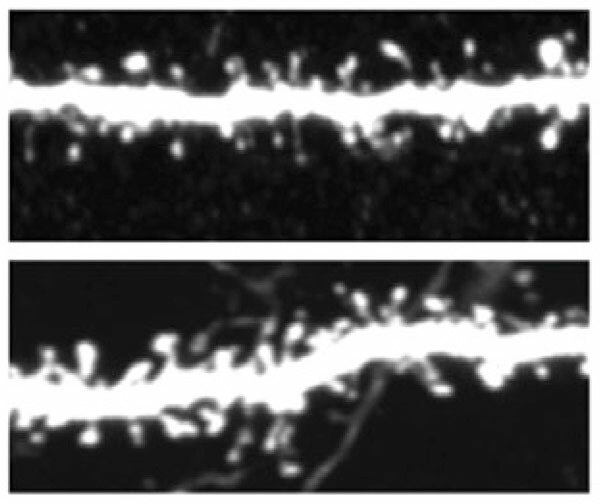 By contrast, mice with underactive UBE3A have the same number of dendritic spines as controls. The findings suggest that mutations that lock UBE3A in an ‘on’ state disrupt early brain development. The autism-linked mutation falls into this category, the researchers say. Previous studies have hinted that the ability of UBE3A to tag proteins for destruction is essential to the formation of synapses. The new study bolsters this theory. The findings are consistent with other evidence that the brains of children with autism have too many synapses. They also point to a critical period during which UBE3A influences brain development.